OSU’s “Waving Song” victory tradition started in 1908 when a speech instructor went to New York looking for a senior class play and came back humming the hit song In Old New York. Using the tune, he rewrote lyrics for OSU’s college follies. The college choir sang the song for the finale and swayed as they waved farewell. The audience rose from their seats and joined in the rhythmic wave. A new tradition was born. 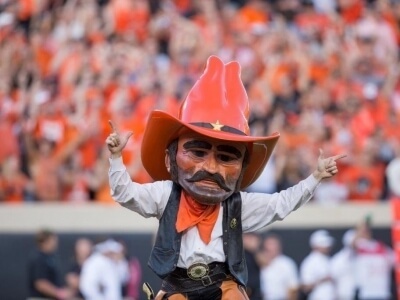 The OSU mascot originated from a real person, Frank B. Eaton, who came to the middle of the U.S. from the east coast shortly after the Civil War. Between the ages of eight and 15, Eaton practiced his marksmanship so that he could avenge his father’s death. He earned the nickname “Pistol Pete” after beating out many cavalry competitors in a marksmanship contest at Fort Gibson, Oklahoma. He was a U.S. Deputy Marshall and later owned a blacksmith shop. For 35 years “Pistol Pete” Eaton attended OSU athletic events and building dedications, signed autographs, and posed for photographs as a living symbol of OSU. Only after Eaton’s death in 1958 did others become Pistol Pete.